Patricia has been teaching yoga fulltime since 2008. Her classes incorporate creative sequences, strengthening movement, Kundalini kriyas, great music and meditation. She has over 1200 hours of training in yoga, and is also a certified Pilates instructor. She has developed Yoga Core and currently teaches it at numerous studios in NYC. 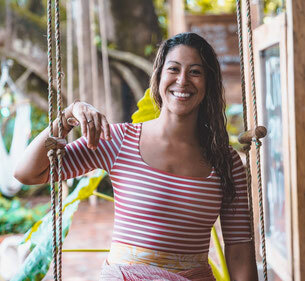 She is the Co-founder of the Lila Yoga Teacher Training and the founder of Love Surf Yoga, a retreat company that curates surf, yoga, and meditation retreats around the world. Patricia currently lives in Bedstuy, Brooklyn and is originally from Caracas, Venezuela. Traditional Trainings: Yoga Effects (200 hour); Conquering Lion Teacher Training (300 hours); Kula Yoga Advanced Teacher Training (75 hours); Kids Yoga with Bent on Learning (75 hours); Pilates Mat with Equinox (35 hours); Pilates Apparatus with Erica Bloom (250 hours).